“The Hut-Sut Song.” Words and music by Leo V. Killion, Ted McMichael, and Jack Owens (1941). Recorded by Elsie Carlisle with orchestral accompaniment under the direction of Jay Wilbur on July 4, 1941. Rex 10021 mx. R5971-2. In 1941, Time Magazine noted the existence of the older tune, but had difficulty finding anyone who could remember how it went. The similarity between the two songs probably indicates not plagiarism or authorial skullduggery, but mere hut-suttery. “The Hut-Sut Song” is a novelty song typical of its era (its nonsensical lyrics might remind one of the crypto-sensical and similarly infectious “Mairzy Doats,” which would be composed two years later). Its utter wackiness and surprising popularity inspired a short film portraying a boarding house full of people (played by “The King’s Men” ) who sing it incessantly. The proprietor has them removed to a mental hospital, where they continue singing “Hut-Sut” in a padded cell. 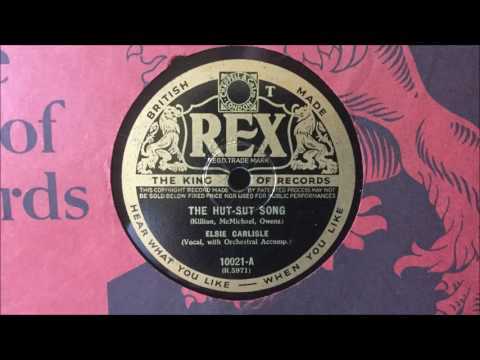 Elsie Carlisle’s version of “The Hut-Sut Song,” recorded under the direction of Jay Wilbur and with the instrumental and choral accompaniment of his studio band, is surprisingly pretty. It is perhaps precisely because the lyrics are so inane that they highlight nicely her crisp, sweet voice. Elsie’s wartime recordings are of a flavor very different from her earlier work, and while the underlying compositions are largely not to my taste, her vocal excellence shines with the aid of the slightly better bandwidth provided by more modern recording technology. In 1941 “The Hut-Sut Song” was recorded by artists in America such as Freddy Martin and His Orchestra (v. Eddie Stone), The Jesters, Joe Reichman and His Orchestra, Johnny Messner, Ella Logan, Horace Heidt and His Musical Knights (with vocals by Donna and Her Don Juans), Frankie Masters and His Orchestra (with vocals by The Swingmasters), The Four King Sisters with the Rhythm “Reys,” The Merry Macs, Sammy Kay and His Orchestra, and The Hoosier Hot Shots. There were notable radio broadcasts of the song by Glenn Miller and also by Bing Crosby and Connee Boswell, who sang a duet incorporating verses that nonsensically combine items from Chinese restaurant menus. Other British recordings of “The Hut-Sut Song” were made by Lew Stone and His Band (v. Carl Barriteau), Nat Gonella, Harry Roy and His Band (v. Marjorie Kingsley), Billy Cotton and His Band (v. Dolly Elsie), and Harry Leader and His Band (in a Paul Jones Medley). I would also note that there were three recordings of “The Hut-Sut Song” in 1941 by artists in Sweden! One can only wonder what the Swedes thought about the ridiculous suggestion that the song had anything to do with them, but apparently they were amused. Marsie Doats? How about Mares eat Oats and Does eat Oats and little lambs eat ivy?